Even if you have a favorite family stuffing, every now and then it's nice to make something new. 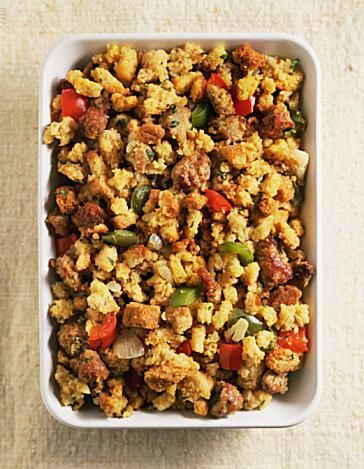 This delicious sausage stuffing is full of fall flavor, thanks to a combination of sage, thyme, apples, dried cranberries, and whole wheat bread. You can put this stuffing into a turkey or you can bake it in the oven or cook it in a slow cooker. Just make sure the stuffing reaches 160 F on a food thermometer before you serve it for food safety reasons. Gather the ingredients and preheat the oven to 350 F.
Spread the bread cubes in a single layer on a large baking sheet. Bake for 5 to 7 minutes, or until evenly toasted. Transfer the toasted bread cubes to a large bowl. In a large skillet, cook the sausage and onions over medium heat, stirring until the sausage is evenly browned, stirring to break up the meat. Add the celery, sage, and thyme; cook, stirring, for 2 minutes longer to blend flavors. Pour the sausage mixture over the bread in the bowl and toss gently with your hands. Mix in the chopped apples, dried cranberries, and parsley. Drizzle everything with the turkey stock and melted butter, and mix lightly, using your hands. Spoon into turkey to loosely fill and roast bird according to turkey recipe directions. If any stuffing is left over, bake in a greased casserole at 350 F for 30 to 45 minutes until lightly browned and crisp on top and the temperature reaches 160 F.